E.L.F. Nail polish swatches | Memorable Days : Beauty Blog - Korean Beauty, European, American Product Reviews. I bought a few stuff at the E.L.F online store last week. E.L.F. stands for Eyes Lips Face. They sell heaps of products for your eyes (like eyeshadow, mascara), lips (like lip balms, lip gloss), face (like foundations, concealers), but also nail polishes, make up brushes and bath products. All for a very low price ^___^! I only bought some nail polishes and make up brushes. I'm going to review and show you some swatches of the nail polishes today and I will review the brushes later ;). All nail polishes are sold for €1.- each! Whoaaaaa budget price o_o"~!! I actually don't expect much for a €1.- nail polish. 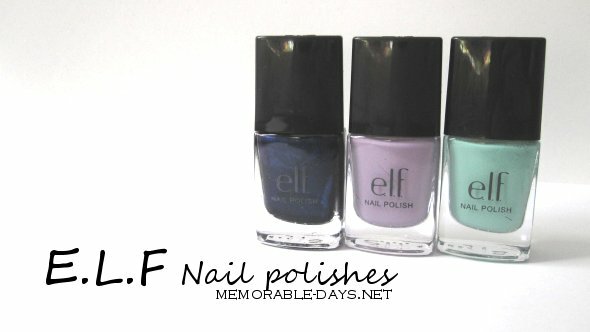 I really love the packaging of E.L.F nail polishes. It somehow looks so expensive haha ='D! As you can see it has a great packaging~ its black & white and the nail polish bottle won't break easily. Can you believe that this is €1.- each o_o"?! The quality of each nail polish is different, keep that in mind ;). I was really in love with this nail polish when I saw this color on their website. However I could see some stripes after I applied the nail polish. I even applied two coats, but I still could see it >.<". Too bad that it didn't have a smooth finish. The quality is just so-so, but like I said before, I didn't expect much for a €1.- nail polish. It's a rich shade of blue, it's not sheer, it dries quickly and it goes on smooth. I had only put one layer on my nails, the second coat wasn't even needed. I'm very pleased with this nail polish and I do think it's worth the €1.-, so I would recommend this one :). This nail polish has a lovely color and it's not sheer. However, I could see stripes after I applied it and it didn't have a smooth finish, it's just like the mint cream nail polish. Such a pity =(, its a lovely color though.